A musical and spiritual journey capturing the hearts of listeners with the and soaring beautiful meditative melodies of Varanasi, India and also the fire and passion of Spanish Flamenco and Middle Eastern Rhythms. Born into one of India’s greatest flute-playing families, award-winning bansuri (flute) virtuoso Vinod Prasanna shines as an outstanding performer of authentic traditional and contemporary Indian music and as heir to the musical treasure of his ancestors. Vinod also performs exquisite improvisations and divine flute song of other world and meditation music. Vinod commands the stage with grace and tenacity, via captivating passion, technical brilliance and a wonderful performance style. Vinod’s sublime flute song takes the listener on deeply moving journeys, both musical and spiritual; wherever he plays, he captures the hearts of his audiences with emotive melodies, exquisitely improvised rhythms and stirring beauty. Simply, Indian music at it finest. From the royal courts of old to the modern music stage, the Prasanna family has performed for more then two-and-a-half centuries, and Vinod continues this legacy. Hailing from Varanasi, regarded as one of India’s holiest cities, Vinod’s late grandfather Pandit Vishnu Prasanna introduced him to the bansuri, and more recently, Vinod’s uncle – acclaimed musician Pandit Rajendra Prasanna – taught him and further inspired his playing. Vinod has performed and toured extensively throughout his homeland, overseas and in Australia. Performances include the Folk Dance Festival in Delhi in 2005; Bhagavad Gita recitals; performances at Varanasi’s famous Benares Hindu University in 2009; and tours of north and south India. Internationally. In 2006, Vinod also won the prestigious Sahara All-India Flute Competition. 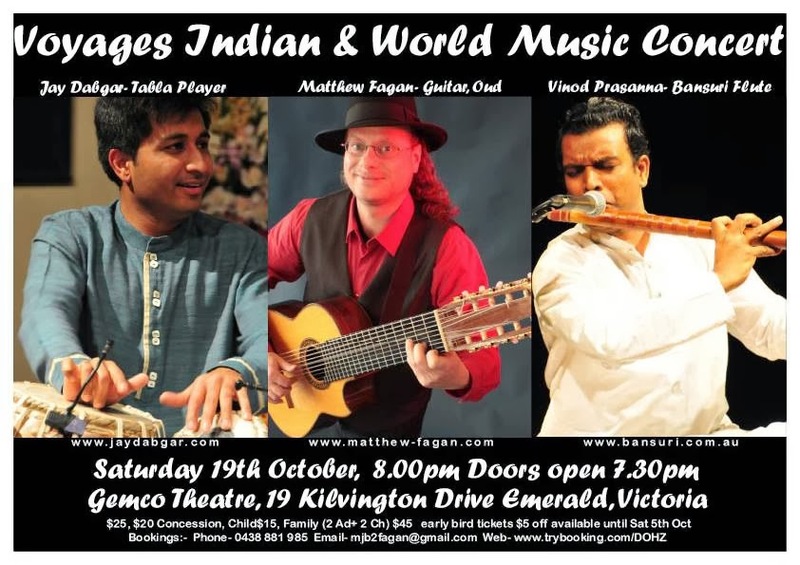 Based in Australia since 2008, Vinod is recognised as an unrivalled Bansuri soloist. Vinod continues a family legacy that celebrates more than two-and-a-half centuries of Indian music. Born and brought up in a family of tabla-makers, Jay has been living in an environment of music and instruments since childhood. In India Jay has performed in respectable Indian music concerts, such as Saptak Annual Festivals, Sankalp Saptah and the Saarangi Utsav. Jay has also accompanied renowned artists such as Pt. Vishwa Mohan Bhatt and Smt Manju Mehta. He has also performed in front of maestros, such as Ustad Zakir Hussein, Pt. Kumar Bose, Pt. Jasraj, and Pt. Rajan & Sajan Mishra. Since moving to South Australia in 2006, Jay has made a remarkable name for himself as an Indian percussion artist. He has performed Australia-wide in various festivals and events, and has performed with renowned artists. Matthew Fagan10 String Spanish Guitar Virtuoso and Oud player http://www.matthew-fagan.com/ Matthew Fagan Custom 10 String Spanish Guitarist, performer with the Buena Vista Social Club, Natalie Cole and for the Dalai Lama at the Parlaiment of World Religions and regularly at world music festivals in U.S.A. and Australia.